Sharon and Charlie tied the knot at the beautiful Sago Cay at Disney’s Grand Floridian Resort at Walt Disney World in Orlando, Florida. 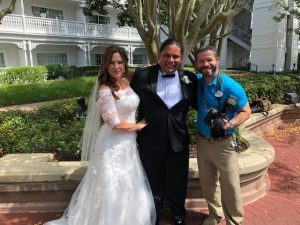 With the backdrop of Cinderella’s castle and the Seven Seas Lagoon the couple were surrounded by their family and close friends as they said traditional vows in a ceremony that spoke of love, friendship, loyalty, and trust. Pedro with Disney Fine Art Photography worked with the couple and their family to take some amazing photographs. Rickie with Disney Fairytale Weddings was the day of coordinator and made sure everything flowed smoothly, as she kept Sharon tucked away before the actual ceremony began. The Walt Disney World Florist created a stunning bouquet for Sharon and also boutonnieres for the guys. The white roses were accentuated with eucalyptus to give them the perfect feel to this intimate wedding. The couple used Married by Mail to obtain their Florida Marriage license before they every arrived in Orlando. They said the idea of having to rent a car and drive to a court house in an unfamiliar city was a daunting thought and they loved the idea of having Married by Mail take care of that for them.